So the day after the run that didn't end too well I asked Sandy if he fancied going out an easy little jog/hike. 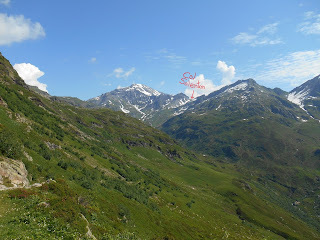 I planned to meet him at 12pm at Les Bossons to climb up to La Jonction at 2630m , a pretty impressive place where at the end of the trail you are greeted with a Glacier. So I headed up Brevent at 11am and ran down to the Bellachat and then back down to the valley floor to meet Sandy getting me a little 10kms in before we started our climb up the other side of the Chamonix valley. I had never actually done this hike before but knew it was a fair old march to the top. It was pretty hot and we were glad to get some tree cover from the sun until we got higher and it cooled down a little. It is a long slog to the top , climbing 1600m over 8kms. My legs were still a little sore from the previous two days efforts but we got to the top in two and a half hours. We hung around for about 30 minutes on the top and then as the storm clouds rolled in we started the descent. The run down was actually really good and we just went at a nice gentle pace. Thighs burning a little near the bottom. Once we hit the road the rain began and got heavier and heavier. Looking at my watch I noticed I had just done a 27km day(more than the previous day) This was meant to have been an easy day so given it was another 6km home and it was pouring by this point I opted for the bus back home. Brilliant uphill training and we even passed the king of the trails himself Kilian Jornet who was descending as we were going up. 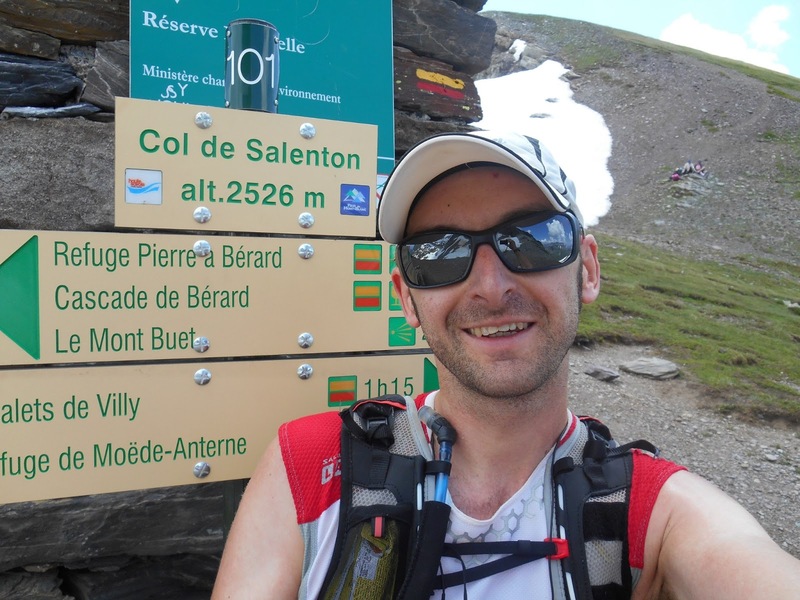 I greeted him with a well done on the new Mont Blanc record (4hrs 57mins Chamonix Centre to Mont Blanc Summit and back! 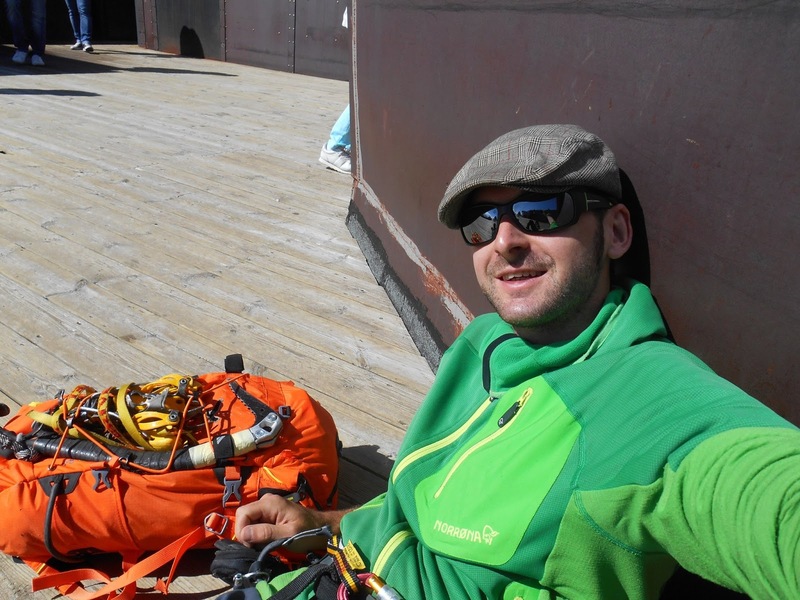 Incredible) and also winning the Ice Trail and received a handshake and a Merci in return. Made my day. The following day(Thursday) was back to work but not starting until 11.30am myself and Sandy got the 6.30am lift up the Midi(3800m) and got a super fast Cosmiques Arete lap in and then sat on the terrace for a couple of hours getting the red blood cells booming before I had to go down to start my shift. Friday was a rest day and on Saturday I managed to squeeze in a descent from Plan Aiguille(2317m) back down to the shop(1035m) on my lunch. Sunday again was time for a rest. So back to my days off and on Monday morning when I woke up I really didn't know what to do. I was at a bit of a loose end and to be honest when I thought about running I really didn't want to. I wanted to climb but had no partner as everyone was working. So after waking at 7am I didn't get out the door until 10.30am after many decisions on what to do. I opted to get the lift to the top of Brevent and run over to the Anterne Refuge where I had been the previous week and then just see where I get from there. Looking up to Mt Buet. Blue skies for now! Once I started running I started feeling better in my head and once I reached the refuge I looked over in the distance to Mt Buet(3106m) and wondered if I should head over. I knew the Col Salenton which leads you towards the summit may be full of snow so wasn't sure at first if it was worthwhile but in the end went for it. First time I had run the trail up to Salenton and it was awesome. Blue skies , super hot and the closer I got to the Col I could see the small amount of snow in it was not going to be a problem to get up. 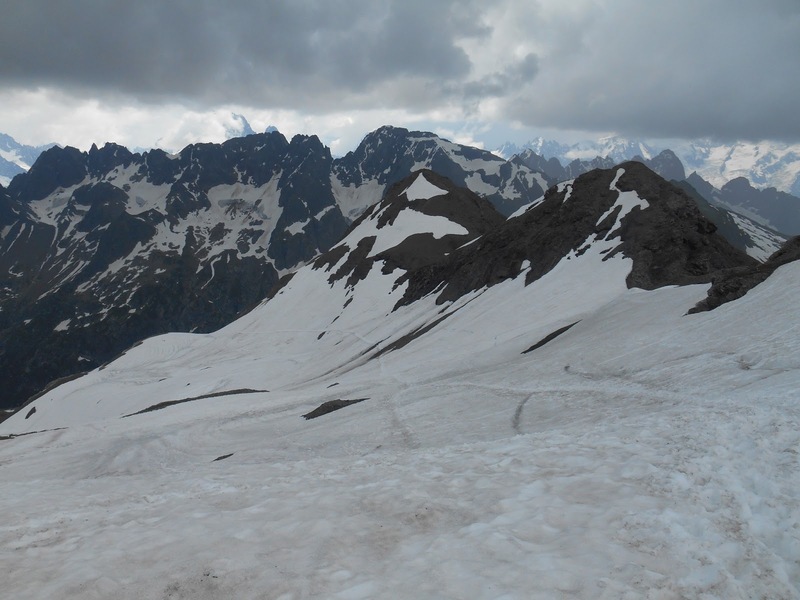 Once reaching the Col the other side towards Mt Buet was a different story and full of snow. None of which was really a problem though as there was loads of solid footsteps in it from the hundreds of hikers who have been up to the summit this summer so I just stayed in the tracks and had a great jog up to the final Col just below the summit. By this point the clouds had rolled in and the forecast for late afternoon thunderstorms was looking as it should have read early afternoon thunderstorms. I wasn't far from the summit by this point so I kept going only to get caught in a horrendous hail storm for 15 minutes but luckily managed to find some kind of shelter from the worst of it. That morning I had only packed a little wind shirt ,the first time this season I left my waterproof at home , Typical. 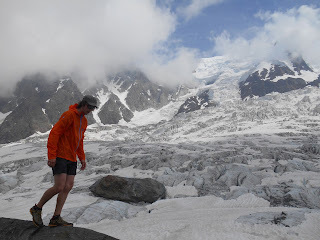 Once I reached the summit the clouds were now thick and very very black so I did not hang around and set off down towards the town of Buet which was a long 2000m descent away. Just before I got to the Berard Refuge at 1900m the hail began again but I kept running and made it into the refuge for shelter as the rain and hail got so heavy I couldn't actually believe what I was watching come down. It was a good 20 minutes of constant downpour until it eased and I headed out and blasted down to the hamlet of Buet on trails that were now transformed to small rivers. From here I bailed and hopped onto the bus back to Chamonix but ten minutes into the journey I was thinking to myself how good I felt so at the next stop I got off and ran back home adding 10km onto my day. 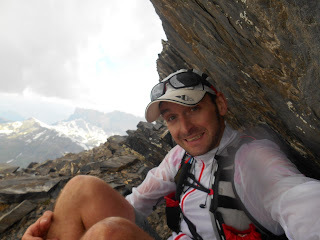 Overall a brilliant day out climbing 1500m and descending 3000m and I finished just 1km short of doing a marathon. So on Tuesday I decided to do something much shorter so opted to run the Chamonix Cross Race in reverse (I hate starting in the valley and climbing up this route , bores the life out of me) so it was 23kms and I must say my legs were pretty damn sore for the last 5kms and I must admit I had to stop twice to give my thighs a little rub. 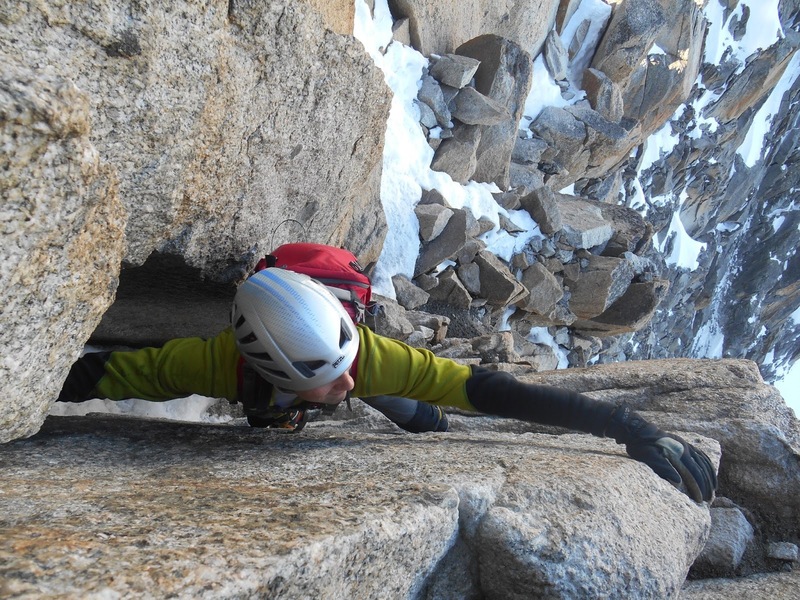 Wednesday was another 6.30am lift up to the midi with Sandy for yet another Cosmiques Arete lap (I swear I could do this route blindfolded by now). Again pretty quick at just over an hour and we got stuck behind a couple of teams who must have started from the hut in the morning. After the short climb we sat in the café for a couple of hours and then back down to Chamonix. Later on I went out a short 11km run in afternoon doing my usual Brevent to Flegere traverse. It was then the lift down to save the knees which have been a little sore recently and then a run along by the river and home. Tested out my TORQ gels and the Rhubarb and Custard really are brilliant , they taste just like the boiled sweets I used to get on lunches when I was at school! They are a slightly thicker Gel to my usual High5 ones which I have used for years and seem to do a good job so I will probably be using a mix of both in Colorado. 76kms covered on my 3 days off. Sandy soloing up the last chimney section on the Arete. Really glad I am able to get up to 3842m quite often now even if it is just for a few hours at a time. I do wish I was doing new climbing routes but morning laps of the Cosmiques and runs in the afternoon ain't too bad training. Leadville news and I have been in touch with my support team. Pacers - Anna , Ben and Kimberley and Crew - Stacey and Jennifer. They have been brilliant help and all seem super keen and excited to help me out. We already have a short run planned the day after I arrive in the states. It really has blown me away how helpful and eager everyone is to support me. It is such a long long day for everyone to hang around and help me try to finish the race and I am so lucky to have them. 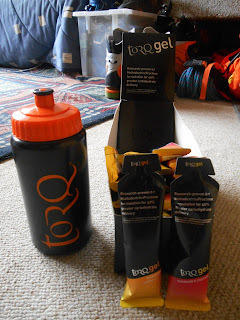 Thanks TORQ. Not tried the Banoffee flavour yet. It is pretty tricky trying to organise rough times for pacers to meet me at checkpoints and also times for my crew to meet me with spare shoes , socks , food oh and I have requested a cooler of Mountain Dew! Especially in a place I have no clue about or even how easy access the checkpoints are. Yeah there is a route map but it is still pretty tricky work hoping you don't make your team wait for hours at certain stages or even be a little quicker and miss them completely. I have my rough times now for the race and I will post them up later. How am I feeling towards the race..hmm still the same really. Just see what happens and hope that I don't get injured. That is my only worry and nothing I can do about it if it happens. I genuinely believe I have the strength and mental focus to cover 100 miles. 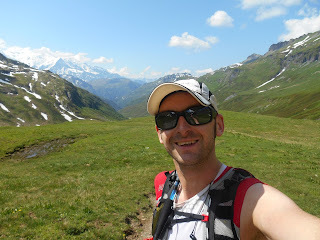 Ever since the Scottish Ultra a couple of years ago (Yes it was only 70kms but I had not really trained all winter) when I was in total agony at 50km and did not want to go on any more. Somehow I managed to pick myself up and run the rest , I ran a 45 minute final 10kms! Something changed inside my head that day , it could have gone either way to be honest as I could have just quit but for some reason I just kept going albeit it total agony. After that race I realised it was true what people say and I always just thought it was the elite who said it but it kind of made sense to me that day. Find a place in your head to put the pain and forget about it and just keep moving your legs. It is such a hard thing to do but anyone can do it if they try. It's way too easy just to give up. Yes it is going to be sore , total agony at times but keep yourself fuelled , pray you don't get cramp and hope you don't get an injury. I have no doubt in my mind even from halfway at Leadville I will be in some pain but as long as I can keep relatively injury free and within the cut off's then I believe I can do it , there is no point going into the race scared of it. At the end of the day it is only a race albeit a pretty long one but it is something I want to try and enjoy and not just suffer. The key to completing it is simple , eat and drink from the start and just take the pace slow. A great quote from a previous finisher (not a winner)I read the other day , he said “ start off slow and then slow down” Sounds good to me.